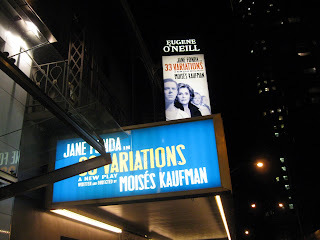 Last night I saw 33 Variations at the Eugene O'Neill. What a feast for the senses! It's about a musicologist, played by Jane Fonda, who must finish her work about Beethoven's 33 Variations (or Diabelli Variations). She is driven to understand why he wrote these variations of a simple waltz by Diabelli. At the top of the show, she is ill and her need to prove her theory becomes a race against her deteriorating health. She has a stand-offish relationship with her daughter played by Samantha Mathis. They have never been close, but near the end of her life, she is forced into physical intimacy because she cannot do anything for herself. The daughter is there to help, in more ways than one, as well as her boyfriend, coincidentally a nurse, played by Colin Hanks. The musicologist travels to Bonn, Germany, to immerse herself in research about the variations at the Beethoven archives. She must rely on a German woman, played by Susan Kellerman, for help in the archives. Eventually, the woman becomes her friend and helps her outside of the archives as well, especially after the musicologist admits that she has been diagnosed with ALS. There are some interesting twists. The play is divided between centuries as we see the parallel story of Beethoven himself, played by Zach Grenier, struggling to finish writing the variations while all the time he is losing his hearing and suffering through other illness. It's a humorous, yet heartbreaking look at illness and what drives accomplishment and knowledge. The lighting is tender on a beautiful backdrop of sometimes sheet music, sometimes shelving in the archives. On this scenery, there are projections changing time and setting. Beethoven's variations are played though out by Diane Walsh on a grand piano on the floor of the orchestra section in front of the stage. It's absolutely lovely and joyous. I found the storyline of the illnesses of both Beethoven and the musicologist sad, but at the same time, a gentle, touching and joyous journey. They are all triumphant in the end. The staging is beautiful and the acting is top drawer. It was a thrill to see this ensemble lead by Jane Fonda, who I have enjoyed in many movies. The combination of the piece itself along with the live performance of variations by Diane Walsh made this a very moving and memorable experience for me. how lucky u are to have been able to see it.